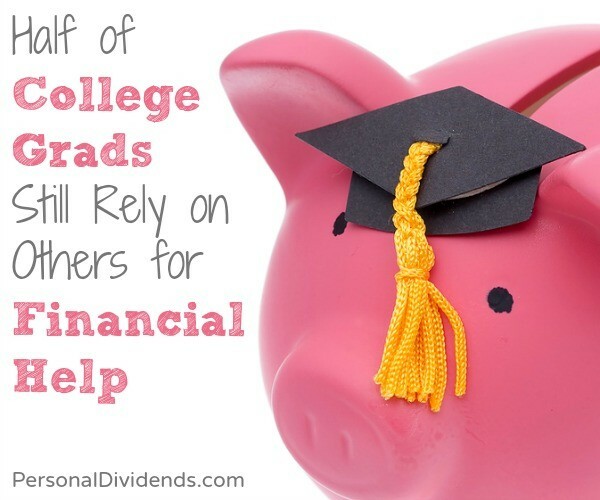 According to a recent study reported on in CNN Money, it looks as though about half of college grads still rely on others for financial help… and this is two years after graduating. It’s not really all that surprising when you combine the state of the job market (it’s tough out there, in spite of the declining unemployment rate) and the fact that many college graduates unthinkingly racked up tens of thousands of dollars in debt, sure that they would be able to get a good job at the end of the day. Now these grads are underemployed and can’t make their student loan payments. The “help” reported in this article ranges from a few bucks to make ends meet now and then to outright living at home. However, the “help” is measured, however, it remains somewhat disturbing that so many young adults are relying on others and unable to make it financially on their own. If you check off these three things, you are a fully-fledged adult, ready to live in the “real world.” And, of course, you are supposed to have a job to help you afford these milestones. Go to college, get a good job, start your life as an independent adult. All of that is changing now. According to the article, 28 percent of the respondents don’t consider marriage an important goal, 27 percent don’t care about having children, and 19 percent don’t think owning a home is important. Finally, 16 percent say that living on their own isn’t important. At any rate, there seems to be a shift taking place. Financial independence isn’t as important to the up-and-coming generation and that could make things harder for those caught in the middle. There are a number of Baby Boomers who feel “sandwiched.” They are caring for their aging parents (the Greatest Generation) and at the same time many of them are providing some level of financial support to their Millennial children. Some of them undoubtedly feel like it would be nice for their children to pick up some of their own slack. How Can Millennials Move Forward with Their Finances? This doesn’t mean that Millennials are doomed to financial dependence. There are some things they can do to improve their finances. One of the realities of this time in history is that technology makes it easier than ever to start businesses. It’s possible to earn money online, or even to telecommute to a more traditional job. This might be one way for Millennials to break out of their cycle. Starting a business to earn more money can help. Another idea is to invest for the future. Many people are wary of investing, but even with the cyclical crashes that happen with the stock market, it’s still one of the best ways to build long-term wealth. While there is a lot of short-term volatility, in the long run the stock market has yet to lose out. Additionally, Millennials can look for ways to help their parents if they live at home. Remember: You might be back with mom and dad, but you are older now. It’s possible to help with chores, and to contribute in some way. You’re not a teenager. The new state of things requires some getting used to. But Baby Boomers need to make sure that, even as they help their kids get back on their feet, they aren’t putting their own futures at risk. Marriage and family might not be as important to the current crop of young adults, but that doesn’t mean that they can’t make the effort to move toward financial independence. If They’re Not Prepared, Is Getting a College Degree Worth It? We recently discussed on the Money Mastermind Show whether it might be better to focus on an employable trade if the 4 year degree is no longer providing the income students hoped for.